Is it a good thing that much of the effort to police corporate misconduct seems to have been shifted to lawyers retained by the companies under investigation? A corporate investigation can easily cost a company millions of dollars, and sometimes much more. The German conglomerate Siemens paid over $1 billion in legal and accounting fees for its global inquiry into extensive bribery by employees. Companies would prefer not to conduct an investigation at all. But having a law firm they hired overseeing the inquiry means they can maintain control over information, and minimize any surprises. Perhaps no state illustrates the political perils of ethics enforcement better than Georgia, where the ethics commission has been the nexus of more infighting, vitriol and litigation than a Univision novella. Keeping track of all the resignations, firings, accusations and countercharges there has challenged even the most knowledgeable observers of Peach State politics. Three executive directors have resigned or been fired since 2006. Two other employees collected $405,000 in damages for allegedly wrongful termination. Lawmakers stripped the agency of 40 percent of its funding, its power to make new rules, even its name. Two former top-ranking officials allege the commission fired them for investigating suspected campaign abuses by Gov. Nathan Deal. Thousands of candidate disclosures swamp the agency’s online filing system, paralyzing it at peak periods for many users. Violators continue to avoid stiffer penalties because the commission has not devoted the resources to formally notifying them. Thin staffing keeps the staff from reviewing even 10 percent of the tens of thousands of filings it receives each year. Much of this has come to pass, critics say, because the commission answers to the very politicians it’s supposed to regulate and investigate. Legislative leaders set its budget, control its powers and, along with the governor, decide who its five members will be. In the view of many of the body’s critics, that system has failed. The state ethics commission is an agency in free fall. That is not news to local officials who complain of its slow, inefficient bureaucracy, or state officials who kick it around like a political football, or even good government groups wailing at its ineffectiveness. Still, the completeness of its collapse is striking. In five years, the commission’s funding declined 41 percent, and its staff was cut by a nearly equal percentage. The number of cases it handled plummeted even more. Civil penalties it levied for ethics violations dropped 94 percent. ...even if this deal passes legal muster, it still stinks to the public, and Duke's leaders failed to follow to standards of good behavior. The directors at Progress Energy have publicly stated that they feel duped, misled by Duke into a merger they never would have approved had they known that Johnson was a dead man walking. The former internal watchdog for the U.S. Securities and Exchange Commission violated ethics rules by overseeing investigations that touched on people with whom he had “personal relationships,” an outside review found. H. David Kotz, who resigned as the agency’s inspector general in January amid questions about his tactics and conduct, shouldn’t have participated in a probe of the SEC’s office re- organization because he engaged in “extensive” and “flirtatious” communications with an employee associated with the project, according to the review. Kotz also shouldn’t have opened an investigation related to R. Allen Stanford’s Ponzi scheme because he was friends with a female attorney who represented victims of the fraud, investigators said in the 66-page report. Defence firms "not open about anti-corruption measures"
The Transparency International Defence Companies anti-corruption index 2012 finds that 85% of defence industry leaders are not speaking up enough about the importance of ethics and preventing corruption. It also says that only 10% of companies have good disclosure of what they do to stop it...one of the reasons the defence industry has been prone to corruption in the past is that so many defence contracts have been secret, with little public pressure brought to bear. The Freedom of Information Act, signed into law by President Lyndon B. Johnson on July 4, 1966, is designed to reduce the amount of secrecy surrounding government decisions. Individuals and organizations have the right to file requests with 100 federal agencies subject to the law, which requires them to answer the query within 20 working days or offer a timetable for the information's release. In 2011 the Department of Justice established www.FOIA.gov, a government website that aggregates annual FOIA data for the 100 agencies subject to the law. According to the most recent request disposition data, a little more than a third of the requests received across all agencies are fully granted. So out of a total of 45,000 transactions analyzed, that's nearly one in eight trades . . .
. . . or an average of 43 transactions per person. 34 members of Congress...took steps to recast their financial portfolios during the financial crisis after phone calls or meetings with (Treasury Secretary) Paulson; his successor, Timothy F. Geithner; or Federal Reserve Chairman Ben S. Bernanke, according to a Washington Post examination of appointment calendars and congressional disclosure forms. 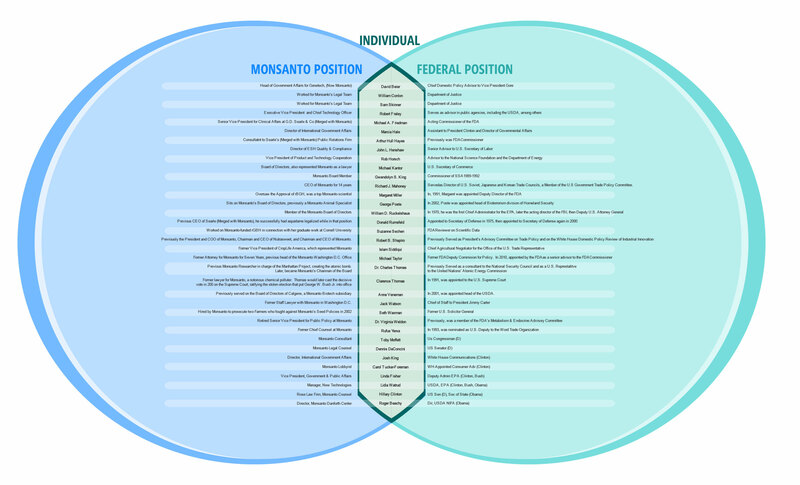 AUTHOR'S OPINION: "Once you realize just how many of Monsanto's employees have shifted into positions of power within the federal government, it suddenly becomes a lot easier to see how this biotech giant managed to rake in a net income of $126 million for the first quarter of fiscal year 2012..."